Wood-destroying insects and other pests can cause serious problems in the wooden structural components of a house and may go undetected for a long time. Their presence may not be noticed, but the damage they cause is usually seen before the insects are found. 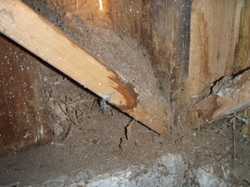 Our inspectors are licensed structural pest inspectors with State of Washington Department of Agriculture and are trained with the latest techniques in locating and identifying wood-destroying insects and organisms.